I tend to really enjoy Chilean red wines from the Colchagua D.O. because the good producers usually produce wines that are of considerable quality and show a defined sense of place with their character. I love the typical black pepper and eucalyptus notes that these wine often bring to the table. The terroir is unique, and for this reason I really love to explore the wines of Chile. 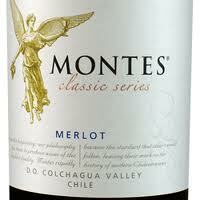 The 2009 Montes Classic Series Merlot is composed of 85% Merlot, and 15% Cabernet Sauvignon, and was aged for six months in American oak barrels. On the nose I get aromas of black pepper, eucalyptus, earth, blackberry, dark chocolate, and just the slightest hint of dill. It's quite an intriguing bouquet and one of the most interesting and complex profiles you can find on a $10 wine. On the palate the wine is juicy and fruit forward, showing flavors of black cherry, dry blackberry, pepper, spice, herb, and a touch of oak. It's a medium-bodied wine that finishes with a touch of dry tannin and some dark chocolate and anise notes.